Of all the early trail blazers one of the most controversial, and surely one of the most unlucky, was Samuel Pierpont Langley. This distinguished astronomer, the director of the Smithsonian Institution, was well into his fifties, when the lure of the air gripped him. He began by making elastic band propelled models based on Alphonse Penaud's little aircraft. Then, in 1889, a little aero steam engine designed two decades earlier by John Stringfellow was presented to the Smithsonian. Studying this historic curio, Langley realized that better steam engines could be built and decided that he could build them. 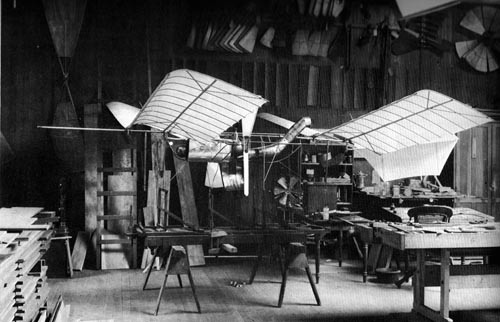 In 1891 he built the first of his model Aerodromes as he called them, but they were constructed with steel frames, making the models to heavy to fly. For the next five years Langley doggedly kept building models, trying to solve the power-to-weight problem. Finally in 1896, he produced a steam-driven model---a sort of double monoplane with wings set in tandem---that flew for three quarters of a mile and then came down only because the fuel gave out. A quarter-size model of the Langley Aerodrome. Before attempting a full-scale version of the Langley Aerodrome, he built a quarter-size model which flew successfully, the first time a gasoline engine had actually driven an airplane. In October, 1903, he was ready for what he confidently believed would be the first sustained, man carrying, heavier-than-air flight in history. A news account reported the following: "The newspapermen waved their hands. Manly looked down and smiled. Then his face hardened as he braced himself for the flight, which might have in store for him fame or death. The propeller wheels, a foot from his head, whirred around him one thousand times to the minute. A man forward fired two skyrockets. There came an answering 'toot, toot,' from the tugs. A mechanic stooped, cut the cable holding the catapult; there was a roaring, grinding noise--and the Langley airship tumbled over the edge of the houseboat and disappeared in the river, sixteen feet below. It simply slid into the water like a handful of mortar..."
There was a second attempt to launch the Aerodrome, but it broke up again as it left the catapult. Manly was recovered unhurt from the river both times. Newspapers made great sport of the failures, and some members of Congress strongly criticized the project as a waste of taxpayer's money. Langley, was deeply disheartened by the failure (coming as it did as the last of the funds had been spent) and was also deeply hurt by the negative press. He decided it would not serve any purpose to request additional funding and thus ended Langley's 16 years of aerial experiments. 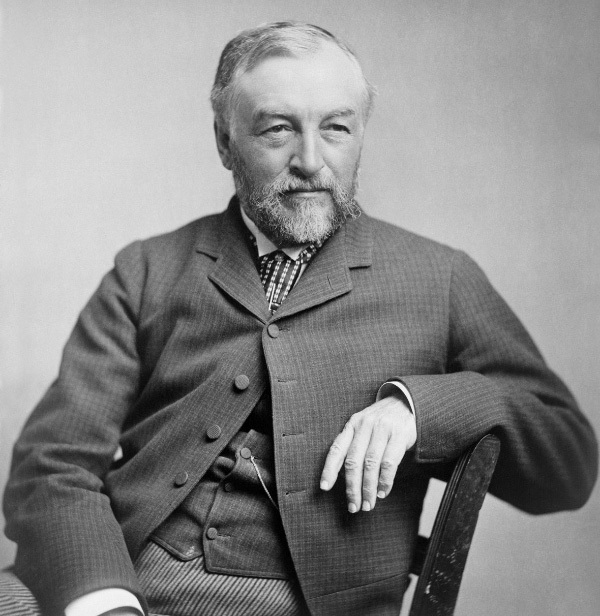 Samuel Pierpont Langley died in 1906 after a series of strokes, a broken and disappointed man. 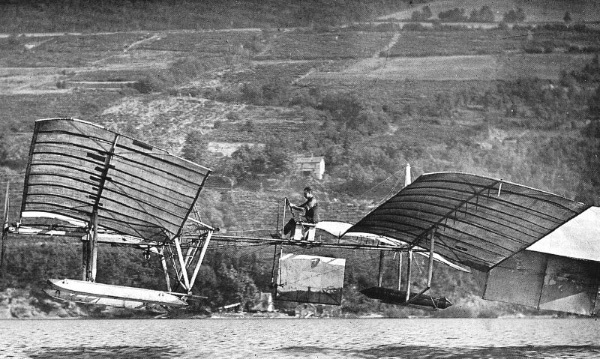 Glenn Curtiss flying the highly modified 1903 Langley Aerodrome over Lake Keuka. Years later in 1914, the Aerodrome finally achieved flight, and was flown several hundred feet by Glenn Curtiss, as part of his attempt to fight the Wright Brothers' regarding their aeroplane patents. However, the aeroplane was heavily modified and the courts upheld the Wright's patents. 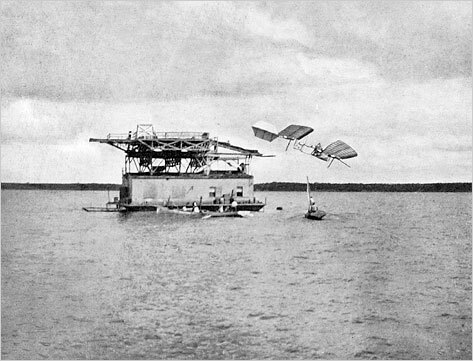 This only emboldened the Smithsonian to display the Aerodrome in its museum as "the first man-carrying aeroplane in the history of the world capable of sustained free flight". The Smithsonian's action triggered a decades-long feud with the surviving brother, Orville Wright.